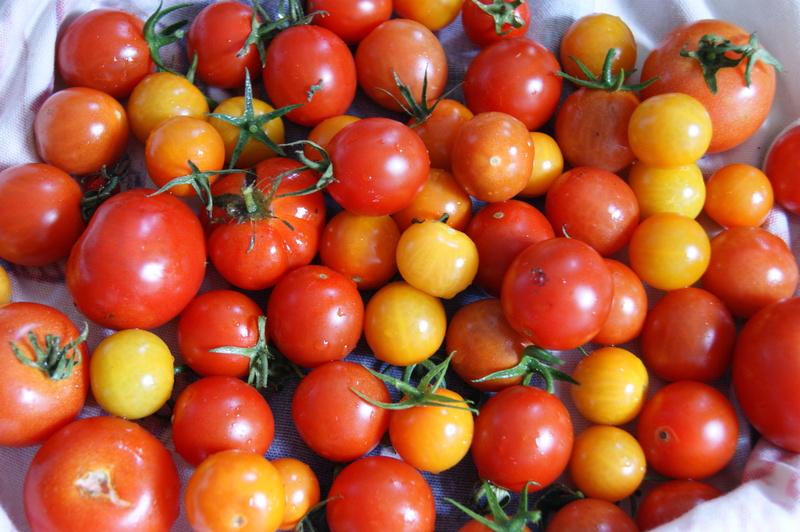 I suspect this harvest of late tomatoes is my garden’s last hurrah as it dies down for winter. I’m holding out for a few more warm, sunny days to ripen some of the abundant green tomatoes before I start thinking about making chutney and hopefully we’ll have a few pickings from the rainbow chard from the window box. This year was such a mish mash of buying young plants and growing from seed that I’ve forgotten which varieties I have. There are certainly some small Marmandes and Gardener’s Delight, maybe a Shirely or two, but I’ve no idea what the little yellow ones are. They certainly look pretty sitting on my worktop. The last of the homegrown tomatoes don’t always develop that incredible sweetness like their summer predecessors owing to the shorter days and cooler nights. They are perfectly suited to a long and slow roast which concentrates their flavour so much so that each bite is a burst of sweet, sour and deep tomato taste. I like to throw a handful into a salad or risotto or serve them with cheeses. And I know I’m always harping on about keeping things in the freezer but if you have a bag of these stashed away you have a little taste of summer on hand all winter long. There’s no exact recipe here, more a guide to be tweaked depending on the size and quantity of your tomatoes and what flavourings you prefer. My only advice would be to wait until you have a lot of tomatoes and roast a big batch. 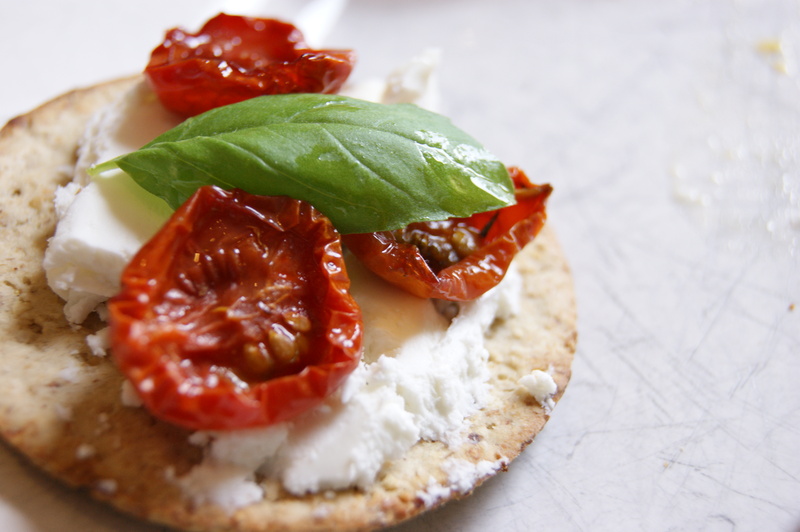 Arrange the tomatoes cut-side up on a baking tray with a slight edge. Try to ensure the tomatoes are all roughly the same size. Put different sizes on different trays so you can take vary the cooking time. Pour on enough olive oil to coat and sprinkle over the herbs, salt and pepper. Roast for 2 hours checking from time to time. 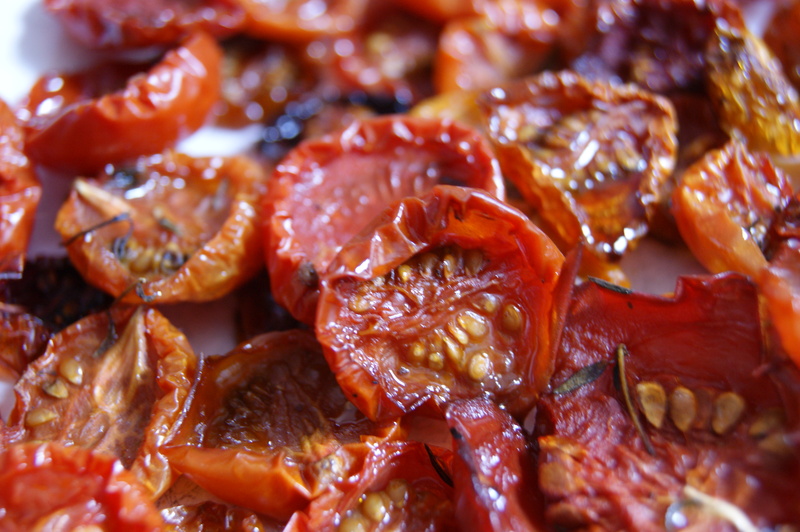 The tomatoes are ready when they are dehydrated and shrivelling but not crisp or burned. Large tomatoes will take longer, up to 6 or 7 hours but you could cut them into quarters to speed things up. This looks delicious, I am a big fan of tomato recipes, I think I should try yours. Thanks for stopping by! Tomatoes are great in any form, they’re one of my favourite foods. Let me know how they turn out if you try slow roasting some.